When I got a puppy from the Humane Society, I discovered that adding a furry member to the household can unleash a series of new consumer choices. Staff Changes Bring New Ways to Make a Difference! Master Recyclers in Washington County will be excited to hear that you have a new resource! Welcome to Kym Buzdygon who was hired as the new Community Outreach Coordinator. Kym will be your new main contact when you need kits, advice or resources in Washington County. Kym previously worked as Program Manager with the Pasadena Audubon Society in Southern California. Prior to her time with Audubon, she attended the University of Washington where she obtained a Master’s Degree in Public Administration while holding down a full-time position doing wildlife rehabilitation. Kym gained experience working with recycling programs when she was an undergraduate at Oberlin College in Ohio, where she was a student recycling coordinator and helped start a school supply and material reuse store. In her spare time, Kym enjoys being outdoors and hiking, climbing, and camping with her wife and their dog Cali or snuggling with their two kitties, Sullivan and Toast. Check the August volunteer calendar for new opportunities that she has drummed up. Once she gets settled, she will also start concidering some Westside gathering for networking and training. She can be reached at Kimberly_Buzdygon@co.washington.or.us 503-846-3651. Looking for more ways to help people use less chemicals and lead healthier lives? Farrah recently joined the Metro Healthy Homes campaign and she invites Master Recyclers to join her! Healthy Homes is out in the community year-round at street fairs, workshops, and hazardous waste collection events. Metro is also building Healthy Homes workshop offerings for underserved communities. Metro needs help from experts such as Master Recyclers to offer these programs. One of the most popular Healthy Homes topics is green cleaning- a simple and easy habit for people to adopt. Healthy Homes also focuses on chemicals in personal care items, children’s products, and basics of recycling/toxics disposal. Farrah looks forward to working with more Master Recyclers to expand Healthy Homes offerings! Explore the company that is turning old polystyrene #6 plastic (foam cups, packaging materials, and Styrofoam) back into basic “crude” so that it can be used to make these products again. The plant recycles up to 10 tons per day of previously unrecoverable polystyrene. RSVP today masterrecycler@portlandoregon.gov ! Space is limited to 15 people. A new section for the Master Recycler Newsletter aimed to keep you informed of changes or let you know when you can have your voice heard. On Thursday July 27th Metro Council passed the business food scraps separation policy. The ordinance obligates city and county governments within greater Portland to require the collection of food scraps from certain types of food service businesses. The required collection of food scraps from businesses would roll out over five years starting in March 2020, with businesses that generate 1,000 pounds or more per week of food scraps – the inedible stuff like eggshells, bones and peels. Eventually nearly 3,000 businesses, including schools, would be affected. Those that generate less than 250 pounds of food scraps per week will not be subject to the requirement. To read more about it, see Metro’s press release from before the ordinance was passed. Can Portland ditch the disposables? City of Portland will listen to feedback from public, people with disabilities and businesses before vote on ordinance in Fall 2018. Portland City Council directed the Bureau of Planning and Sustainability (BPS) to develop a strategy to reduce single-use, plastics – including plastic straws – and to create an inclusive process to develop the policy to reduce single-use plastics. Plastic straws are commonly littered in the United States, according to a 2017 Ocean Conservancy report. Over 663 species, including sea turtles, whales, dolphins and seabirds, are impacted and in many cases, die from ingesting or becoming entangled in the plastic debris. A small work group was formed to help the initial development of the single-use plastic reduction policy. That groups consists of businesses, advocates and people with disabilities. They will meet in July and August to form a recommendation for Mayor Wheeler to consider. Staff from the mayor’s office and BPS will facilitate the conversation and document the feedback. Once the recommendation from the work group is complete, staff will look to the community to provide additional feedback to the policy. Look for opportunities at August events, your local library and City and County government buildings. Your input on the policy is very important, we want to hear from you. You can call, email, or sign up for email updates on how the project is going. Send us your questions and comments here: 503.823.7202 info@portlandoregon.gov. Visit www.portlandoregon.gov/bps/reduceplastics for details and to sign up to receive policy development updates and event notices. Cecelia Warner completes more than 2000 hours! Cecelia (Class 47) has done it again: she has gone where no Master Recycler has gone by reporting over 2000 hours! Writing grants, starting the new Shake and Fold non-profit, writing and singing songs, tabling, staffing information booths, helping at PlanetCon, tagging along with the Recycling Advocates’ Bring Your Own Cup campaign, co-forming the Westside Master Recyclers team, organizing a durables system for vendors at the Forest Grove Farmers’ Market, presenting on food waste prevention for Adelante Mujeres. This is just the short list of the many activities that Cecelia Warner did to rack up more than 2000 volunteer hours. Anyone who works with Cecelia will tell you she has tireless energy and enthusiasm which she brought to each and every one of these 2000 hours. Thank you for your commitment, Cecelia. It is an inspiration to us all. Rob Kappa Reports 1000 Hours! A little sense of humor, a depth of knowledge and a lot of heart goes a long ways and Rob Kappa (Class 37) is living proof. Rob has been inspiring people to capture foodscraps with wormbins, use salvage materials and recycle for more than 1000 hours. As a Master Gardener/Master Recycler he brought special knowledge to his presentations to groups like brownies. His background in construction brought added experience to his many hundreds of hours he spent promoting the Rebuilding Center at Remodel and Home and Garden Shows. But Rob has also spent much of his time helping other Master Recycler get started. He worked to support teams of Master Recyclers to volunteer in the Backyard set up at the Zoo. And he joined forces with fellow Master Recycler Millennial Colleen Johnston (Class 36) to set up a recycling booth at the Milwaukie Farmers’ Market where they not only tag-team questions on recycling, greener cleaner, energy efficiency and wormbins and composting, but they also act as Mentors by inviting folks from the most recent class join them. So, we are sending Rob his very own vanity license frame so that he can proudly share that he is a Master Recycler. Thank you, Rob for your commitment and your humor. We have five new Official Certified Master Recyclers this month! Thank you for meeting your commitment of reporting 30 volunteer hours. Willard Chi (Class 66) was super excited during the class about the Library of Things in Hillsboro and was ready to advocate for one in Clackamas County. He quickly joined the repair movement, participating as a bike fixer in the West Linn Repair Fair, and then joining a team to plan and implement the inaugural Repair Fair in Lake Oswego. Tasha Johnson (Class 66) joined some of her fellow classmates to talk with folks about waste prevention and recycling at the Zoo Lights in December. She then joined the Westside Master Recyclers in organizing two PlanetCon events for collecting non-curbside recycling and offer information to the community. She then joined in at the Forest Grove Farmers' Market waste station with fellow Master Recyclers there. 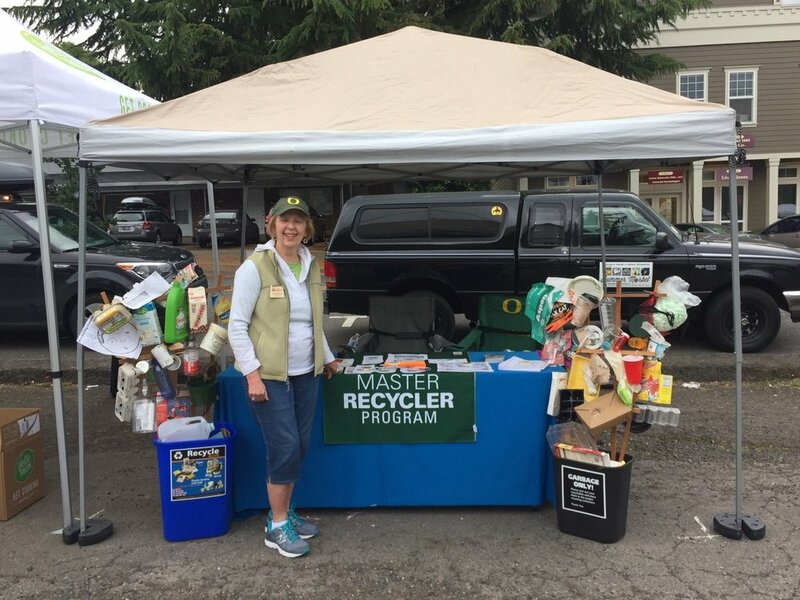 Charlene Silveira (Class 66) also became a certified Master Recycler at the Lake Oswego Repair Fair! Charlene also participated in the Westside Master Recyclers PlanetCon which she said was a great event to be part of. She is pictured here at the Fix-it Fair in North Portland promoting reuse, repairing, fixing and sharing and as a fixer at the Repair Fair in Lake Oswego. Cherie Kennedy (Class 68) kicked her volunteer hours off at the Canby Spring Garden Fair talking about greener cleaners and completed them talking up recycling with folks at the Cully Park Opening. In between she did some local outreach in her Milwaukie community including touring recycling with her sister, distributing recycling bags in an apartment building with Clackamas County and joining fellow Master Recyclers at the Farmers' Market. Cherie has just gotten started! She is planning a recycling series for her fellow parishioners at the Milwaukie Presbyterian Church. Kathi Swanson (Class 68) asked tough questions in the class demanding to know why packaging can’t be reduced. She also seems to love the bustle of a good farmers' market. She joined the Milwaukie Farmers' Market Master Recyclers twice and then set up a booth for recycling questions at the West Linn FM. Kathi also helped residents recycling those hard-to-recycle materials at the SW Community Recycling collection event. Inspiration often arrives in unexpected packages. See how five local artists – Carolyn Drake, Liz Grotyohann, Benjamin Mefford, Brittany Rudolf and Eduardo Cruz Torres - transformed an unpredictable stream of trash from the Metro Central transfer station into art. Their works will be on display and sale at the Bison Building, 421 NE Tenth Ave., Portland. GLEAN helps raise awareness about our consumption habits and inspires new ways of looking at trash as a resource. Opening reception from 6 p.m. to 9 Friday, Aug. 3. Exhibit runs through Aug. 25. Gallery Hours: noon to 5 p.m. Friday through Sunday. Gleanpdx.org or 503-278-0725. Oregon Department of Environmental Quality’s Materials Management Grant Applications are Now Online! The Oregon DEQ will award up to $500,000 in grants for projects that promote waste prevention, reuse or recovery. Local governments, nonprofit organizations and federally-recognized tribal nations are encouraged to apply. Funding for projects that prevent wasted food is also available to public schools, colleges and universities. For this grant round, there will be added scoring points for projects that serve economically distressed or otherwise distressed communities. A call for tribal representatives is also planned on August 3, from 11 a.m.-12 p.m.
August is often prep time for fall, school starting, and the third quarter coming up. When you prepare for school supplies this year - do you reduce, reuse, and recycle? I want to know! One important aspect of sustainability is simply sharing our stories. So, I want to hear yours - in the context of how green are you. Check out the link, fill out the form, and schedule a follow up coffee with me. The top 8 stories will be published on my blog in the fall.